Leave a comment below stating which animal you would love to be and why, then complete the Rafflecopter widget for further entries. 4. 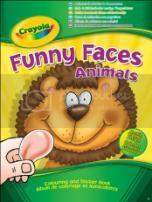 One entrant shall win a Crayola Funny Faces Animals book.